The LG V30+ at $929 it’s an awesome phone that has taken the World by surprise, and a significant upgrade over the V30, especially in terms of music quality and reproduction. Amongst those upgrades (we’ll discuss them in the article) the V30+ comes with 128GB and earphones inside the box. Many online reviewers have been more than happy with the fast download speed it comes with. Now, when it comes to design and almost everything else, the V30+ is much like the V30, but with more storage, and more modern frequency bands, and of course, the earbuds, at full usage capacity battery life is up to 8.29 hours. Even with a storage capacity of 120GB the phone still has a MicroSD slot for up to 400GB of storage. You may think that all that storage its crazy, but remember that, just like the V30, the V30+ comes with the HiFi QUAD DAC, a five minutes FLACK track can be up to 200MB, while a plane 320kbps MP3 it’s just 11MB, and now, it makes sense to you why you may need all of that extra storage, that is what makes the V30+ so special. As mentioned above, the V30+ comes with its own earbuds, the LGs QuadPlay that takes all the advantages of the QUAD DAC the phone brings. Something the V30 is missing. Another great advantage we talk about was the modern frequencies, and that is due to the fact that The V30+ comes with 4×4 MIMO and it doubles up the antenna branches potentially increasing the bandwidth on each network channel. It also comes with waterproofing, so that is a plus. The LG V30 is a fan favorite, especially if you love the wide angle camera that offers more perspectives of the World than the traditional 2x cameras. When you are trying to take a photo of an entire stage, then the V30 is the premium phone for you. 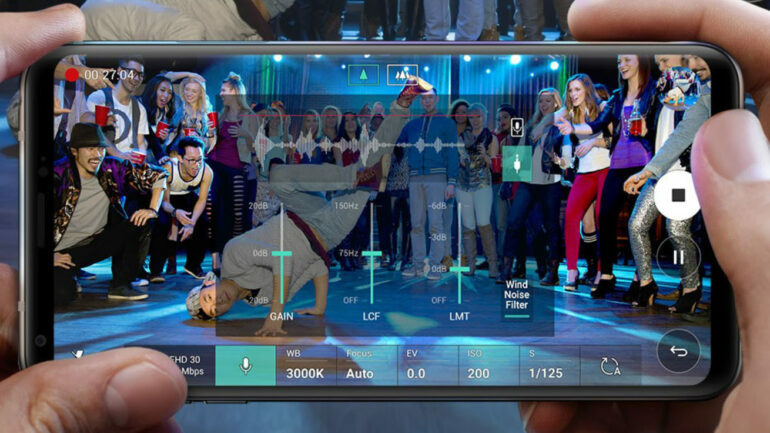 The V30+ also comes with that special feature a raises one up with its audio quality, LG’s QUAD DAC has some of a “cult following” amongst most dedicated fans and the V30+ truly lives to its entire potential on this, and all the crazy storage you’ll need for those heavy audio files. Users are also in love with the network speed the V30+ can achieve, so overall is a win-win scenario with this one. The V30+ is powered by a Qualcomm Snapdragon 835 and 4GB RAM, it features Android 7.1.2 and on top of it LG’s UI. With LG dropping the secondary screen, it has truly worked wonders for the manufacturer, and it is proven on the V30 and V30+ It also features biometric unlocking options like facial recognition and fingerprint sensor. The software features “Smart Doctor” and it optimizes the Phone by freeing the RAM, running diagnostics on various sensors checking their status, and sets the saving mode if necessary. Even with all the customization, the V30+ comes with, multitasking is no problem for it, and it runs smoothly and lags free.